When pitting the iPhone XS Max against Samsung's Galaxy Note 9 in a gaming death match last week, we noticed audio reproduction was noticeably better on Apple's device. We take a closer listen in this video. In introducing iPhone XS last month, Apple said it reworked the smartphone's speaker system to boost stereo separation. Exactly how the company went about achieving that goal is unclear, but the results are readily apparent. This test compares the iPhone XS Max with Samsung's Galaxy Note 9. We positioned a boom microphone a good distance away from both phones and evaluated raw unedited audio to determine how the two handsets differ. 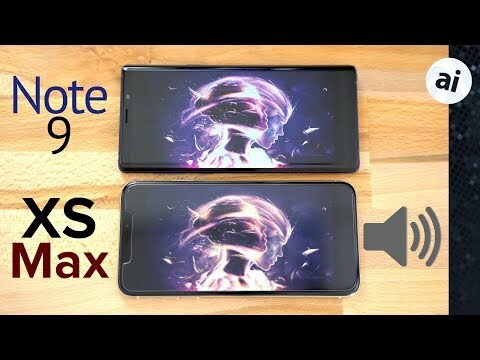 Dolby Atmos is active on the Note 9, while the XS Max has no additional effects applied. Playing our favorite song, we noticed the iPhone XS Max is markedly louder, and the highs are brighter. Not only that, but the bass is a lot punchier. Listening closer, the iPhone XS Max presents a wider soundstage with more separation between the notes, whereas the Note 9 sounds a bit flat. Moving onto the second part of the test, Fortnite gameplay, both phones were set to maximum volume. Again, the iPhone XS Max sound output blows the Galaxy Note 9 away, making for a much better gaming experience. If you haven't already ordered Apple's iPhone XS Max, wireless carriers are incentivizing the purchase. Want to get your hands on a new device asap? eBay sellers are also shipping units now. AT&T Wireless: Buy one iPhone XS or iPhone XS Max, get a second $700 off when you add a line. Verizon Wireless: Get up to $300 off with an eligible trade. Sprint: Get the 64GB iPhone XS for $0 per month with eligible trade-in and Sprint Flex lease. T-Mobile: Save up to $300 on the iPhone XS with an eligible iPhone trade. Those interested in purchasing the Samsung Galaxy Note 9 can take advantage of no tax collected outside New York and New Jersey* when purchasing from B&H, plus a free Samsung Fast Charge Qi Wireless Charging Stand valued at $44.99. Yep. The Max wins in this one. More dynamic-presence and clarity. In the Anandtech article about the A12, there was a problem with the launch of Fortnite cold. From the article: "In the Graphics part of the 3DMark test, the iPhone XS showcases 41% better sustained performance over last year’s iPhone X. In this particular test, the OnePlus 6’s more generous thermals still allow the Snapdragon 845 to outperform the new chip. In terms of peak performance, I encountered some great issues in 3DMark: I was completely unable to complete a single run on either the iPhone XS or XS Max while the devices were cool. If the device is cool enough, the GPU will boost to such high performance states that it will actually crash. I was consistently able to reproduce this over and over again. I attempted to measure power during this test, and the platform had instantaneous average power of 7-8 watts, figures above this which I suspect weren’t recorded by my measurement methodology. For the GPU to crash, it means that the power delivery is failing to deliver the necessary transient currents during operation and we’ll see a voltage dip that corrupts the GPU. When iterating the test several times over a few attempts, in order to heat up the SoC until it decides to start off with a lower GPU frequency, it will successfully complete the test." Could you attempt to run Fortnite cold to see if you can repeat that. I would note that Anandtech was fan cooling the iPhone, something that would not be used in the real world. Edit; Posting problems with paragraphs. The music video sounded "shrill" to me on both phones. But, I am 76 years old and probably do not hear as well as young folks. The iPhone did sound louder. That’s not a difficult piece of music to reproduce. Try something with intricate instrument interplay, not electronic boops and beeps. Coins and Promises by Margaret Becker. I love my XS Max, but the bass passages that rattle the windows in my car while Maggie’s voice glistens, the phone doesn’t even attempt to reproduce. My clock radio does a better job. or try The Walk by Steven Curtis Chapman on the Abbey Road Sessions album. The improv section at the end has such great stereo separation and imaging that I’ve had a passenger exclaim “It’s like I’m right on stage between them”, but on the phone there’s barely a left and a right. Try those two pieces on a “real” music system, then on the two phones. If the Note even comes close to a real music system, I’ll buy one. I also wonder if comparing the phones at 75% volume may have done better than 100% in terms of clarity and distortion. Regardless, I personally find listening to a smart phone speaker any farther away than my lap to be a somewhat grating experience, so while I'm happy the speakers sound better, I'll still plan on having headphones or a real speaker if I actually want to listen to something. The XS had an excess of grating highs. The Note had more bass, fewer highs, but I would bet a more flat audio response. That said, if you think any cell phone, tablet or computer speakers sound good, there is no point in having a discussion on this topic with you. I have both phones currently and find the Xs Max's sound a bit more detailed. It sounds to me as if the Note 9 is trying to accentuate the bass a little at the expense of some detail. Just my 2 cents. "...and if you listen closely, you can hear the stereo separation." I know this is gonna sound harsh, but bro ... you're one of the most widely recognized and most frequent contributors on AppleInsider. As such, your readers expect a lot more from you than a new or part-time contributor. In the future, please do your homework; any less is an insult to our intelligence and tarnishes the reputation of this blog. If you want to record in stereo, try the stereo recording feature that's built-into the iPhone Xs Max (they did give you more than one phone, right?). Failing that, use a Zoom handheld recorder: they're not expensive, and one of your fellow AI crew or journalists probably has one already. Also, try to audition a wider variety of music samples that better reflects your diverse audience. While I found the review informative, I do agree that a more scientific approach could have been used, such as showing the audio output as captured by sound meters. In a previous article, I commented that the Note 9 sounded better with recorded audio, so there may still be a worthy review of audio *recording* capabilities between the two devices. One of the ways I listen to music now is, I get onto my sofa and put the XS Max behind my head, supporting it between the sofa and my neck. When I do this, I get a nice volume and good stereo separation. It's like listening with a pair of earphones.